California’s urban water suppliers are adapting to an increasing population and a growing economy by diversifying supplies and reducing demand. 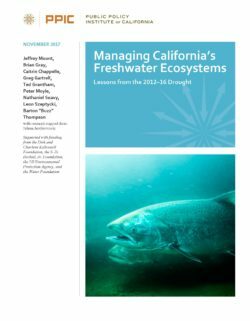 Ongoing challenges described in this brief include managing water quality and developing cost-effective, sustainable local supplies. 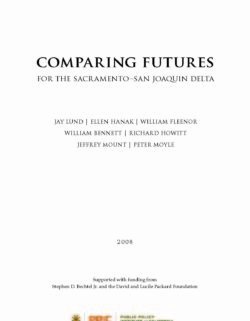 California’s Sacramento-San Joaquin Delta is widely perceived to be in crisis today: its levee system is fragile, many of its native species are declining rapidly, and it lacks strong governing institutions to deal with its problems. 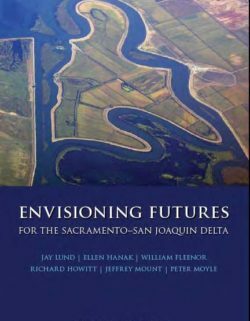 In its current state, the Delta is unsustainable for almost all stakeholders. 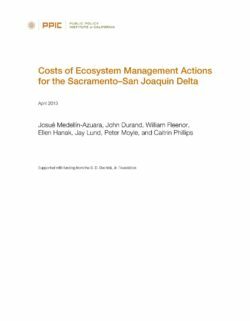 This report provides a comprehensive, scientifically up-to-date analysis and outlines several alternative management strategies for the Delta. 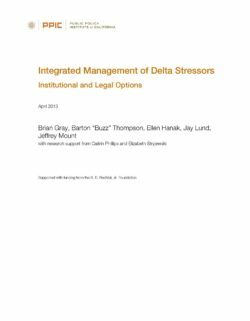 Despite some recent progress, the current institutional landscape for regulation and management of stressors in the in the Sacramento–San Joaquin Delta is highly fragmented. A modest but powerful set of institutional changes can help produce better environmental outcomes while containing management costs—which are likely to exceed several hundred million dollars annually. This report lays out proposals for institutional reform. The 2012–16 drought caused unprecedented stress to California’s ecosystems and pushed many native species to the brink of extinction. It also tested the laws, policies, and institutions charged with protecting the environment. 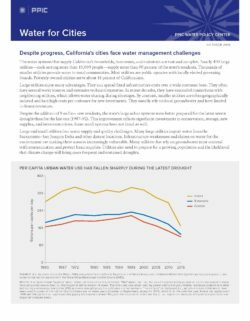 Eight case studies on environmental water management during the drought reveal both strengths and weaknesses in federal, state, and local response that can inform how California addresses future droughts. This past year was a prime example of California’s highly variable climate—and a precursor of the types of extremes that are expected to become more common. 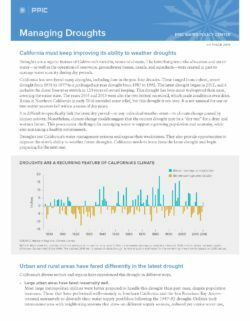 After five years of drought exacerbated by record heat, 2017’s record rain and snow brought more challenges—stressing dams and levees, causing landslides, and adding fuel to fire-prone landscapes. 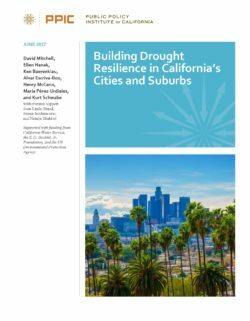 Across California, leaders have responded with a number of policy and management reforms, including some that will help the state adapt to droughts and floods of the future. But there’s more work to be done. 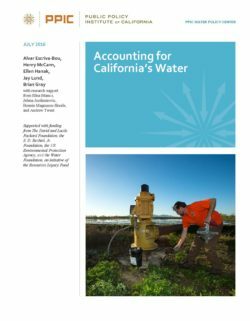 In this policy brief we outline issues that are front and center for managing California’s water supply and natural environment. 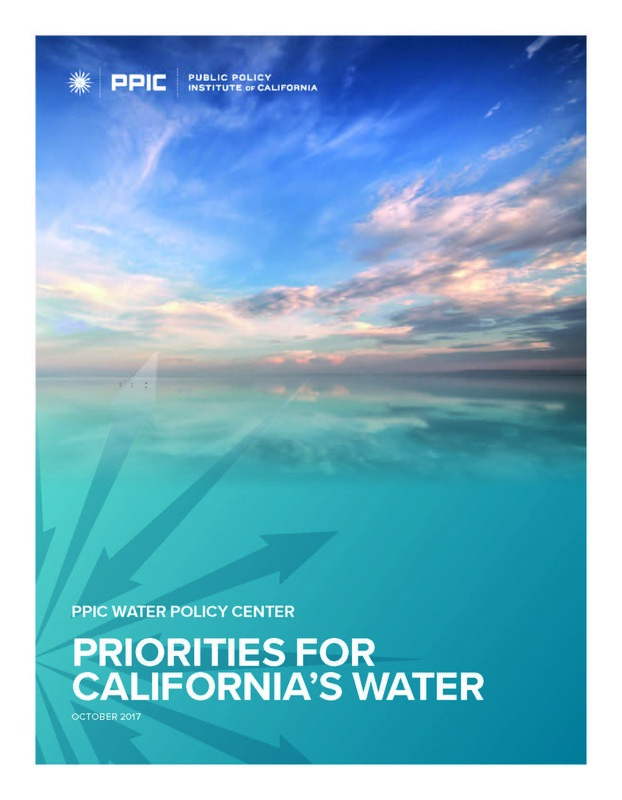 We also suggest priorities for actions that would improve California’s water systems and better support the state’s residents, businesses, and ecosystems.